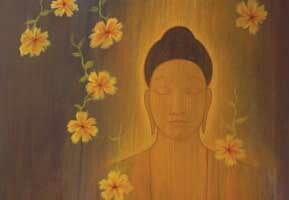 Store > Gifts and Art > Art Cards > Card - "Golden Buddha"
This is a gorgeous image of the Buddha in meditation. The golden color seems to shimmer while transmitting beauty, serenity and inner tranquility. I purchased several. One I keep on my bookshelf for daily viewing. The others have been mailed out to many grateful recipients.